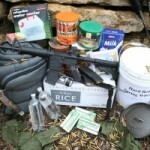 Over the last 2 years there has been a resurgence of a “prepping mentality”. Whether it is for a Doomsday scenario or just to get by safely with a major natural disaster, or severe weather event, the word is out and some people are preparing. With the Nat Geo Show “Doomsday Preppers” , the movie 2012, as well as Bear Grylls, Cody Lundin hitting the media, I thought it might be interesting to note that the ancient(and modern to) Ninja Clans were Japan’s answer to our modern prepping communities. Located in mostly remote areas a ninja clan became less dependent on assistance from the centralized government and more dependent on self-sufficiency than was common in most areas in Japan. They were farmers, fisherman and craftsman, they understood and practiced medicine, military strategy, and of course could protect themselves or fade away into the mountains or surrounding countryside. With the Ninja Juhappan as a core curriculum of knowledge, and the mental philosophy of “enduring heart”’ the ninja had most “preppers” beat hands down in a systematic method of readiness. With all the great comments on my post about Ninja Finances, I will continue to post a bit more or this analogy of the Ninjutsu mindset and knowledge as it applies to some preparations in your life. As I have always said a Ninja is Prepared for all eventualities, why would today be any different than in days gone by? Just some thoughts to think about for your training! Can you remember some of the best moments of your life and or training? I can , and I am sure can as well. What is truly fascinating is that these best or most memorable moments are when we have let go and are living totally immersed in the moment. Now this is not an easy thing to achieve and can be a core tenant in most Buddhist teachings, so go about your next training session being totally Immersed in the moment, feel, breath, taste, touch, visually and hearing all that is going on around you. It can be intoxicating and somewhat overwhelming so be ready to deal with the emotional content you will be taking in. So go out and try to live in the moment! Now I bet you didn’t expect this for a topic! But it does fit very well with our ninjutsu philosophy of survining all things, so here we go. Over the last week my students and I have been carefully watching the situation in Cyprus and how the loss of finances could happen to anyone in a moment’s notice. As we were discussing the grab of people’s money I also brought up the fact that there is almost always a run on the banks when a major storm is going to hit and people move toward cash to purchase items or to have on hand if and or when the power goes down. As we sat and talked they asked me what a type of Ninja like preparations they might consider doing. So here are a few things to add to your “Ninja Finance Preparations”! 1) Have stored cash on hand, both at your residence and a small stash on you at all times. 4) When you don’t have any money, think bartering! Alright, as Soke Hatsumi says “Ok, Play”. Each day I try to reflect on how I can simplify and improve my martial arts practices. Actually I try to live this philosophy in all areas of my life. How many of us have throughout the years met individuals who thought they knew everything there was about their chosen art? Most find out later that they had barely scratched the surface, and drift off to oblivion. Just a few weeks ago, I was invited to a Martial Arts Symposium where many Instructors and students came to teach, learn and share friendship. Between my sessions, I was everywhere trying to learn new techniques or strategies. I was so pumped up when I returned home I did a brain dump into my notebook, and started planning on how I could incorporate all the new ideas spinning in my mind. In all of my time practicing the arts I have always considered myself a “Perpetual Student” always striving and craving to learn more. To this day I cannot resist the temptation to pick up a new martial arts(or skill) book, magazine, video, I dive in take notes and then start to practice. “In the old days, there were no pharmacies. You had to know how to create your own medicines and cures. Therefore, the ninja had to know how to do such things himself. Today, however, you can get medicines from a drugstore. As for homemade gun powder, it is so dangerous. It is not safe to make such things in your home. You do not need to know how to make it. You do need to study subjects like chimon (geography) and tenmon (weather conditions and star patterns). There are so many things that you should know besides taijutsu. As for poison, you may not be able to use poison formulas from ancient times. Many things were regarded as deadly poisons because there were no antidotes in the old days. Today, many drugs we have take away the deadliness of what was a poison yesterday. A few days ago I was reviewing some old notes and I came across this great piece of wisdom from Sensei Manaka and it sure did hit home. Over the years I have been practicing the art of Ninjutsu and have become a “Knowledge Vampire”! Always questing to learn and understand more about various subjects, especially to be become self-reliant. I have worked on first aid skills, became a first responder, SCBA certified, gained reloading skills, covert entry tactics, rappelling, rock climbing, orienteering, weather studies, escape and evasion training, hacking skills and the list goes on and on, but that is what a Ninja of ancient times would do as well. Learn the skills that would continue to keep him 1 step ahead of his enemies and targets as well as to protect and nurture his family and clan as well. Earlier this year I posted 13 in 2013, which was a challenge to you to learn 13 skills in 2013. So how are you doing on that project? This weekend I am off to go camping and teach orienteering, to once again try to sharpen my skills and give back to a new generation just learning the basics. I hope you take away from the short lesson, a drive to learn everything you can in a constant and never ending manner, it may just save your life or that of someone you love. Ps: This past Friday I had the opportunity to use my first aid skills to help an individual whom was having multiple seizures, he still is thanking me for the help a week later. You just never know when an emergency may pop up! The ancient Ninja were always prepared to escape and evade as if they were caught on a mission it would most likely end in torture and or death. Depending on the type of mission they would carry typical ningu(tools) to help them accomplish their mission as well as to escape the scene if and when necessary. Items such as kaginawa, kunai, metsubishi, tetsubishi, shuriken, fire making tools, cloth and first aid supplies were all utilized and carried by our ancient practitioners. 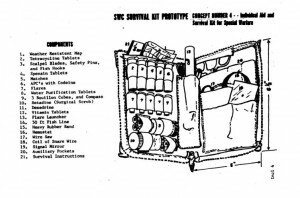 Now recently I read an article on a Solicitation by SOCOM for a new personal Escape and Evasion kit for the Navy SEAL teams, and thought it very applicable to our own training and preparedness for an emergency, so I am presenting that material here for you to add to your training. In a future post I will go into a few more details about creating a Tier 1 kit for your own use. Alright, I do receive a pretty healthy number of emails each week with questions related to the material I post as well as other training and or martial arts related items. So, instead of just answering one off, I will be posting the answers up so everyone can see them. Great question my friend and fellow practitioner! Well, my schedule may not work for you but here is what I do over an average week. Now this is just an average and can “up” fluctuate when I am in a heavy training cycle, as I am in now, or when I add various minimalist camping trips, rock climbing, rappelling, or shooting practice. Also, I did not include time that I practice various skills together. (hint, hint training tip here) I often pair items up so that say while I am stretching I might be reading or lock picking etc. Kill two birds with one stone if possible. For any beginner I recommend no less than 4- 6 hrs of training each week to firmly establish the basic techniques and tactics into your physical skills. ps: stay tuned for Ninja Warrior Conditioning workouts coming soon! Here we are coming into spring and a new podcast for all of you listeners! This entry was posted in Podcasts, Uncategorized and tagged Podcast on March 3, 2013 by admin.